Abstract: A UVA Biometer from Solar Light Co. showed spurious excessive zero-offsets at nighttime. Inspection showed that the cause was a randomly malfunctioning of the internal thermal stabilization. 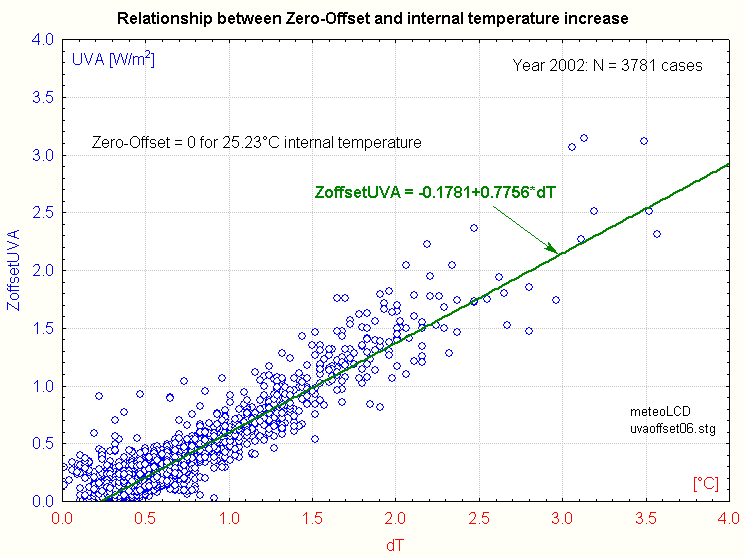 It can be shown that the zero-offset is linearly correlated to the excessive internal temperature, and that it can easily be corrected. A UVA Biometer from Solar Light Co.(instrument # 2828, last calibrated Nov. 1999) showed relatively rare excessive zero-offsets during night-time. The occurances seemed more or less random, and not caused by external meteorological factors. Inspection showed that the unique probable cause is a malfunctioning thermal stabilization. The phosphor converting UVA to visible light is temperature sensitive, so a Peltier element stabilizes it at a nominally 25°C. A malfunctioning of this electronic element was practically always a drift to too high temperatures (e.g. 27 °C), even in very cold conditions; we rarely observed too low internal temperatures. To be able to apply eventual corrections, meteoLCD reads and stores both the UVA irradiance and the internal temperature of the instrument. 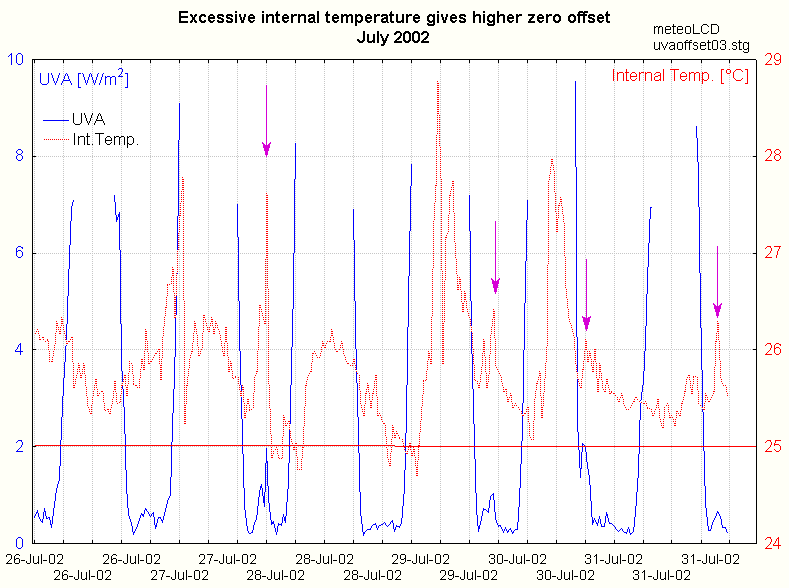 Lets us start by documenting several situations that show in a very clear manner that internal temperature rise (even of short duration) increases the zero-offset. 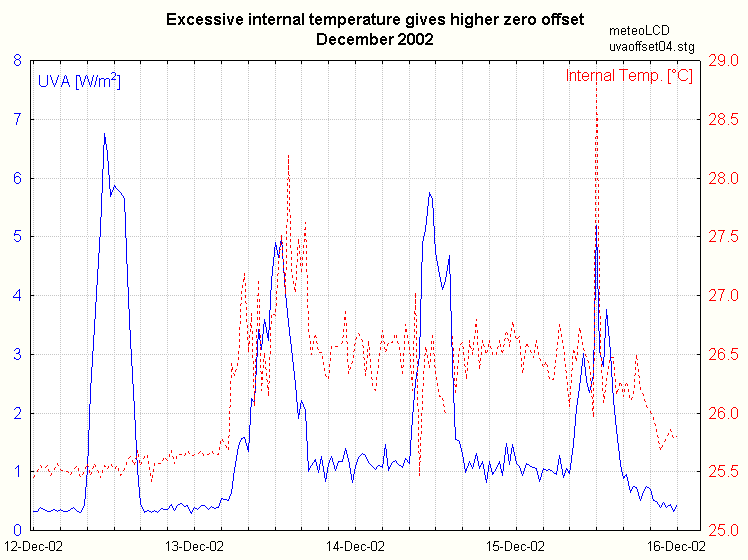 The situation was different during several days in December 2002: this time the temperature stabilization malfunctioned from the 13th to the15th December in a more "constant" manner, increasing the zero-offset by more than 100%. Let us define dT = ( internal temperature - 25) where 25°C is the nominal phosphor temperature. We will define "night-condition" the hours between 00:00 -> 02:30 up to 00:00 -> 06:30, according to the season. 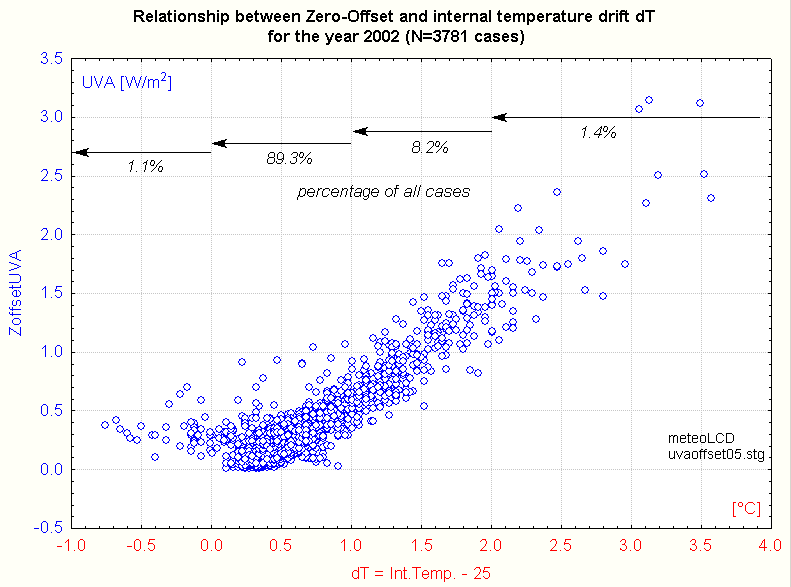 The following figure gives the relationship between zero-offset and dT for the whole year 2002 ( N = 3781 night-time cases). the vast majority lies in the internal temperature range [25 - 26°C]. For internal temperatures lower than 25°C, the zero-offset is a nearly constant 0.25 W/m2. Lets us omit the few points corresponding to negative dT and compute a linear fit to the remaining points. This short paper shows that the night-time zero-offset of the Solar Light Co. UVA Biometer increases with a positive deviation of the internal temperature stabilization. In case of the instrument under test ( #2828) the gradient is 0.78 Wm-2/°C. In about 90% of all cases, the internal temperature deviation was lower than 1°C; some randomly or short-time episodes of misregulation happened, for reasons unknown. The findings of the report allow to compensate the zero-offset, yielding correct night-time values. Solar Light Co. recommends to apply a calibration divider of about 1 + dT/100 to the data in the case of incorrect thermal stabilization. Solar Light Co.: Users Manual (pdf format) of the 501 UV Biometer: this is the manual for UVB Biometer; many items are valid for the UVA sensor.